This is a short review of the mixing techniques used in microarray binding reactions. Current micro-fluidic mixing technologies that are being implemented in the microarray industry include, Turbulent Flow, Rotary Mixing with air bubbles, Laminar flow, Acoustic waves, Surface Acoustic Waves, and Chaotic Mixing. The goal of mixing a microarray binding reaction is to assure that every molecule in solution finds its binding partner immobilized on the microarray as quickly as possible. In other words, the most desirable binding reaction has fast and complete diffusion of all biomolecules in solution over all microarray spots and remains a homogeneous mixture until the reaction is complete. Minimize handling of microarrays, which reduces the possibility of human error. In a turbulent flow system, the hybridization cocktail is mixed by the using random contact with the physical structure of a reaction chamber. One challenge of this type of system is obtaining homogeneity of the reaction mixture. Rotary mixing with air bubbles is performed inside a sealed reaction cassette by rotating a trapped air bubble over the microarray. Binding reactions cannot take place in air, only in solution. Therefore a challenge of this approach is minimizing air bubble-based oxidization of the fluorescent dyes commonly used in microarray reactions, which would lead to lower signals and elevated background. Another challenge is that if an air bubble were to become trapped, the reaction in the trapped area would not proceed. 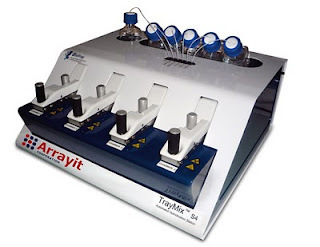 Laminar Flow is generated by using a small diaphragm pumping system at each end of the microarray to move the binding reaction sample back and forth across the microarray. Recent micro-fluidic studies show that laminar flow mixing can produce layers of liquid that flow over top of each other, thus one challenge of this approach is to obtain fully homogeneous and complete mixing of sample during the laminar flow process. Surface Acoustic Waves generated by piezoelectric transducers are used to cause streaming of the hybridization reactions under cover slips or lifter slips. Some of the same challenges that apply to laminar flow also apply to systems that use surface acoustic waves. 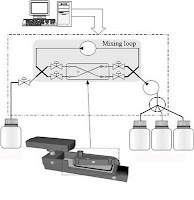 Chaotic Advection Mixing is accomplished using micro fluidic pumps and a mixing loop. The overall movement of liquid in properly configured systems is “chaotic” due to the extremely complex direction and speed of fluids provided by the mixing loop. This type of system provides the most complete mixing of low volumes of liquid in the shortest amount of time. For more information on this patented microarray processing technique please view the product page by clicking here. Below is a movie showing how our system takes a fluorescently labeled biomolecule in solution applied to a microarray, and mixes it completely over the entire microarray in less than 30 seconds. The liquid remains mixed throughout the reaction. The bright white dot is the injection port area for the hybridization cocktail...watch how nicely the reaction reaches equilibrium. If you are evaluating systems, ask your vendor to provide a movie showing physical evidence that they can provide good mixing! I give special thanks to Dr. Djamel Bouraya for providing this video and other information for this blog entry.